ACM-W members at Hack OHI/O 2017In classes where male students significantly outnumber females, it can be hard for women in computer science to connect with other women, and easy for them to feel isolated. Luckily, there’s an organization at The Ohio State University that is dedicated to encouraging women and improving conditions in the computing field. 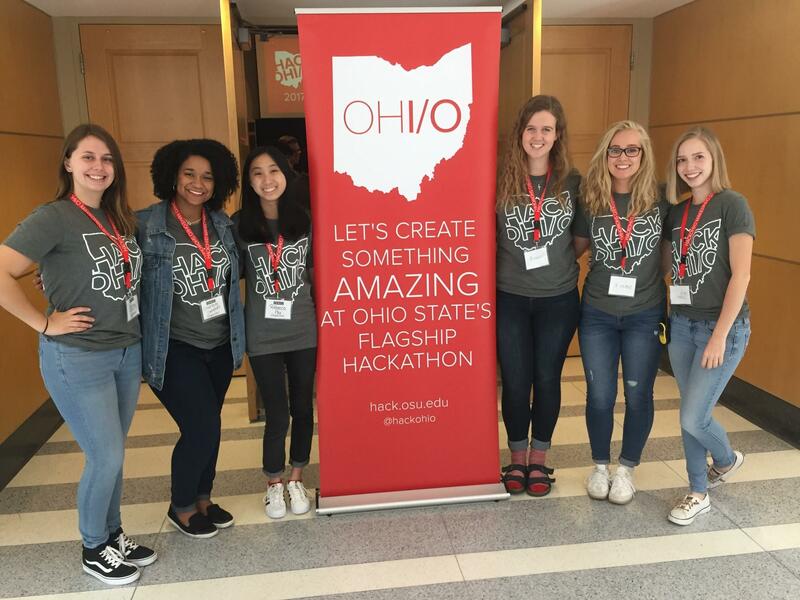 The Association of Computing Machinery Women’s Chapter at Ohio State—or ACM-W@OSU—began changing the educational experience for women on campus in 2003. What started as a small club has since evolved into a comprehensive provider of mentoring experiences for women. 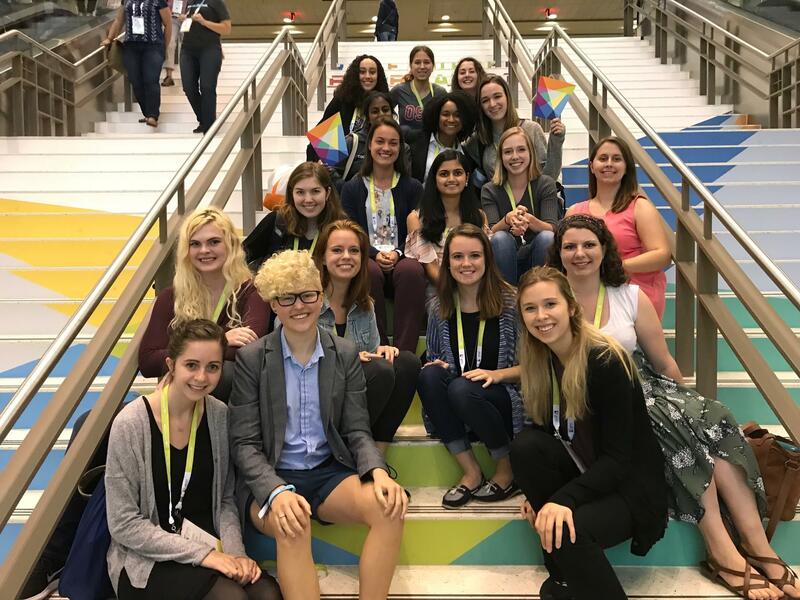 ACM-W members attend the 2017 Grace Hopper Celebration of Women in Computing.Since its humble beginnings, ACM-W@OSU has grown significantly, both in size and impact. The chapter currently has approximately 30 active members who regularly attend meetings, and nearly 200 participating members attended one of 46 ACM-W events during the 2017-2018 academic year. While most members are either CSE or computer and information science majors, others are women in electrical and computer engineering, data analytics, mathematics or other engineering majors. Male students are also welcome, with a 40 percent average male representation at weekly meetings. Activities emphasize mentoring, with professionals as well as college peers. Student leaders have developed strong ties with industry, increasing corporate sponsorship at least fourfold, which advisors say have led to promising careers at Nationwide Insurance, GE Aviation, Google, Microsoft, Apple and Corning. Industry sponsorship also enabled the club to send 40 students to the international Grace Hopper Celebration of Women in Computing in September 2018 in Houston. 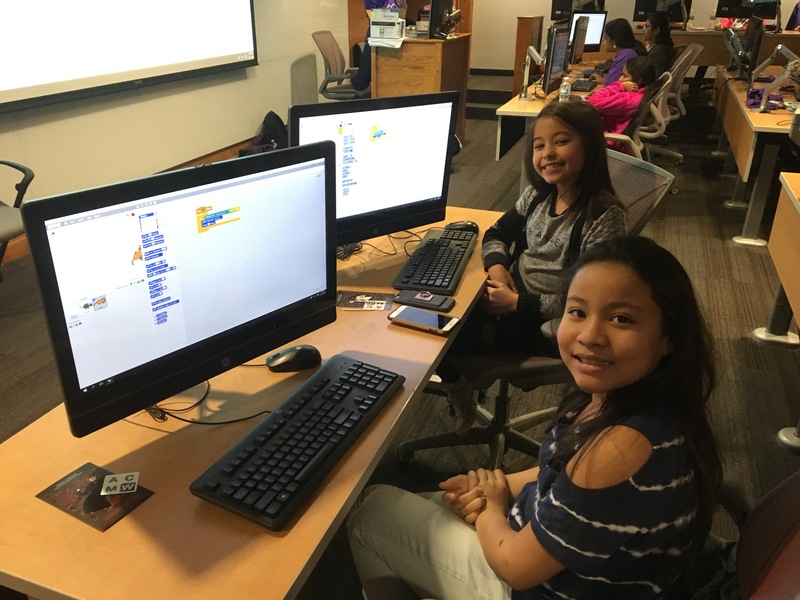 Middle school girls attend the 2018 Buck-i-Code workshop.ACM-W is looking out for the next generation as well, with middle and high school outreach programs that are computer science-focused. At the group’s annual Buck-i-Code workshop, nearly 30 middle school girls come to campus for a day during which members showcase their research projects, such as self-flying drones, Python-programmed robots and language processing systems that can compete in Jeopardy. The event is twofold, as it not only teaches young girls about the world of computing, it builds confidence in the students leading the workshop. Another hallmark of the group is providing a safe space for members to talk openly among their peers about any hostile or difficult situations they’ve encountered as women in the computing field. “I love our lean-in socials because it’s great to hear about what our members are dealing with and going through and then how they’re working to improve the tech space for everyone,” said Campbell.